ChronoLinksTM is the original watch adapter for the Leatherman Tread/Tread LT Multi-Tool that allows you to customize your Tread or Tread LT with different watches. We also offer a variety of accessories designed to enhance your experience with the Leatherman Tread/Tread LT.
ChronoLinks is brought to you by the engineering team at Ansix DesignsTM. Being the original Leatherman Tread Watch Adapter company, we stand 100% behind our products and you can expect the highest quality from us. We provide excellent service for our customers along with expertise and access to watch databases to find a solution for your watch. Please visit our Gallery and/or Instagram page for photos from thousands of our satisfied customers. ChronoLinks (Formerly known as TreadLinks) is a watch band adapter designed specifically for the Leatherman Tread/Tread LT Multi-tool. Leatherman will sell the QM1 watch in the near future, but they only offer one watch style. With ChronoLinks, you can use the Leatherman Tread/Tread LT with any combination of watch faces. We've now expanded our product line up to include accessories specially designed for Tread users. We've now added the ChronoLinks +1mm Spacers, allowing better fitment for watches with odd lug widths from 17mm, 19mm, to 23mm, 25mm, and more! Additional sizes will be available in the future. Please contact us if you are unsure if your watch is compatible with ChronoLinks. Your options are unlimited with the ChronoLinks. Our customers have paired the Tread/Tread LT with Apple Watch, Pebble Time, Tag Heuer, Rolex, Omega, Bell & Ross, Panerai, Casio G-Shock, and many more. Chances are, we will have a size that will be for your watch. All ChronoLinks adapters are made of precision machined stainless steel to match seamlessly with the look and feel of the Leatherman Tread/Tread LT and your watch. Two finishes are available to match the Leatherman Tread/Tread LT: brushed stainless steel and brushed black diamond-like carbon. Every box includes a pair of ChronoLinks adapters in your choice of size and finish so that you can attach your Leatherman Tread/Tread LT Multi-Tool watch band to your watch right out of the box! Why is ChronoLinks for you? 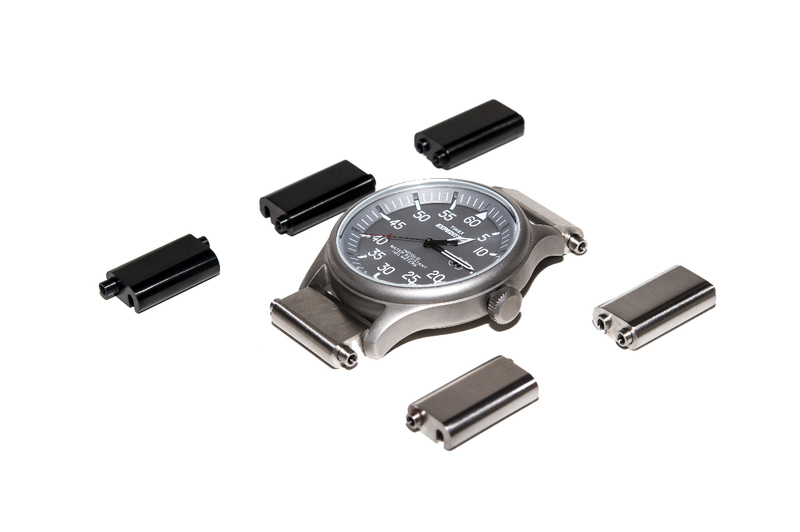 Until now, there is no way to use your Leatherman Tread/Tread LT Multi-Tool watch band on your favorite watch. We want you to be able to express yourself in every situation, because you shouldn’t have to change for your watch; your watch should complement you. 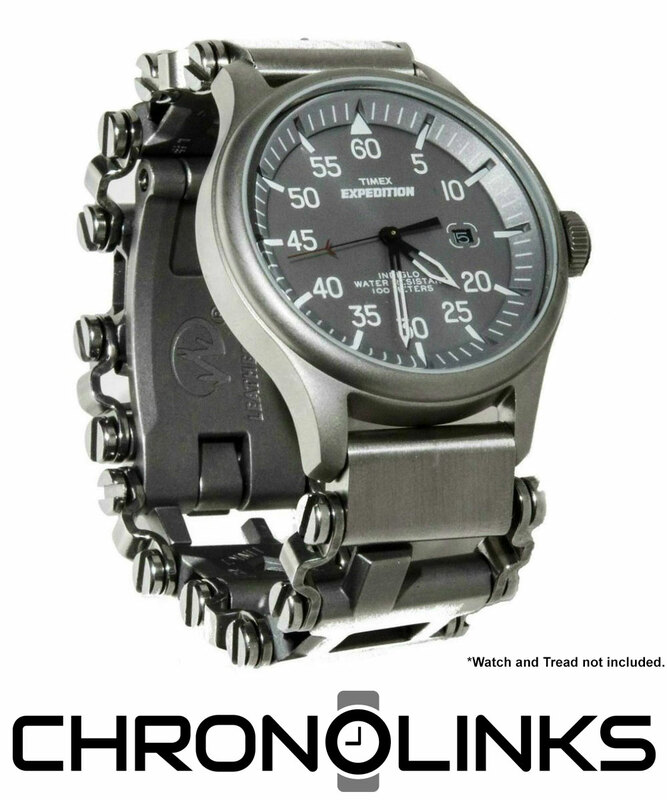 With ChronoLinks, you can wear your favorite watch with the Leatherman Tread/Tread LT Multi-Tool watch band. The Comfort Screws are stainless steel screws that are designed specifically to replace the original screws on the Leatherman Tread/Tread LT Multi-tool. Our screws use a hex key to install and they remove the sharp edges that are created with the flat head portion of the screw. The comfort screws are chamfered with all sharp edges broken to make the Leatherman Tread/Tread LT more comfortable than ever. Two finishes are available to match the Leatherman Tread/Tread LT: brushed stainless steel and brushed black diamond-like carbon (Black DLC). These spacers allow for better fitment for watches with odd lug widths such as 21mm or 23mm. Each spacer is 0.5mm wide and is designed to be added to both sides of our ChronoLinks watch adapters. Sold in a set of 4, these spacers are available in brushed stainless steel and brushed black diamond-like carbon (Black DLC). The ChronoLinks Leatherman Tread Adjustment Links were designed to give Tread and Tread LT owners more adjust-ability for a more comfortable fit. If your Tread is a little tight but adding a tool link is much too loose, we suggest using one pair of adjustment links. If your Tread is a little loose but removing a link makes it very tight, we suggest removing one tool link and using two pairs of adjustment links. Sold in a pairs, the Adjustment Links are available in brushed stainless steel and brushed black diamond-like carbon (Black DLC). All Rights Reserved. All product names, logos, and brands are property of their respective owners. All company, product and service names used in this website are for identification purposes only. Use of these names, logos, and brands does not imply endorsement.